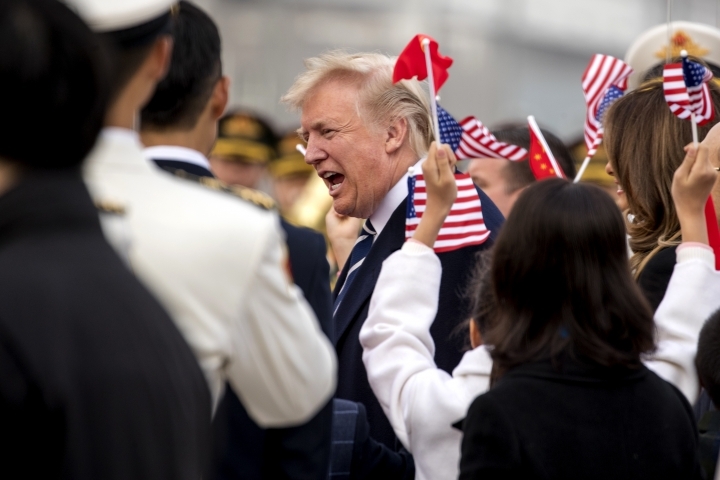 President Donald Trump is vowing to change "one-sided and unfair" trade relations with China but says he doesn't blame China for taking advantage of the U.S. in the past. 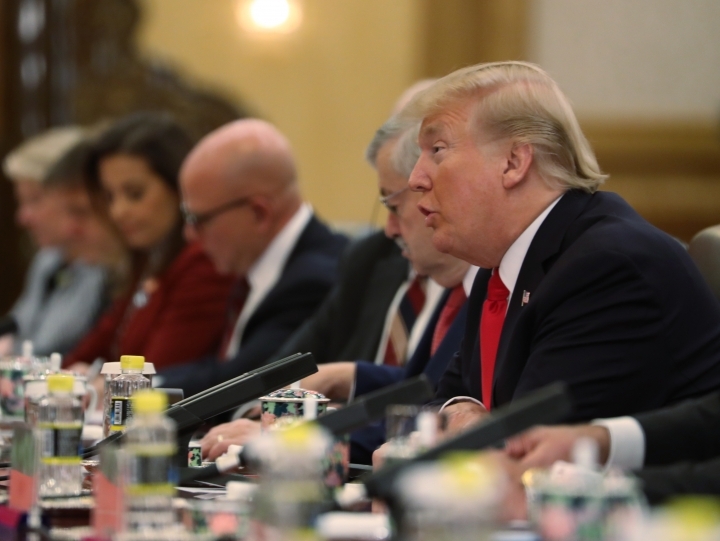 Trump says during a joint appearance with Chinese President Xi Jinping (shee jihn-peeng) at a business event that trade between the U.S. and China has not been "very fair" for the U.S. and is citing the large trade deficit between the two global powers. The U.S. president says we must immediately address "the unfair trade practices" that drive the deficit along with barriers to market access and the theft of intellectual property. But Trump says he doesn't blame China and gives them "great credit." But he says they need to "fix this" and he's hopeful it will happen with Xi. President Donald Trump says a military parade China arranged in his honor was magnificent and "the world was watching." Trump says people from "all parts of the world" have already called him about it. He did not explain, but added that "nothing you can see is so beautiful." Trump commented at a meeting Thursday with Chinese President Xi Jinping (shee jihn-peeng) at the Great Hall of the People in Beijing. Trump is on a state visit to China, the third stop on his five-nation tour of Asia. 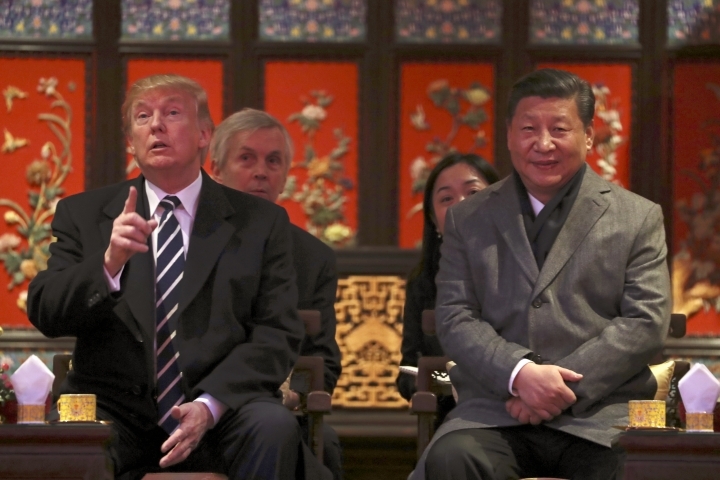 President Donald Trump is hailing his personal relationship with China's president and says they'll work together to solve not only their mutual problems but also "world problems and problems of great danger and security." Says Trump: "I believe we can solve almost all of them and probably all of them." Trump spoke at a meeting Thursday with Chinese President Xi Jinping (shee jihn-peeng) at the Great Hall of the People in Beijing. Trump also complained about U.S. trade with China getting "so far out of kilter" and pledged to Xi that they will make it fair. He also said that he Xi believe a solution exists to the problem of North Korea's nuclear and missile weapons programs. 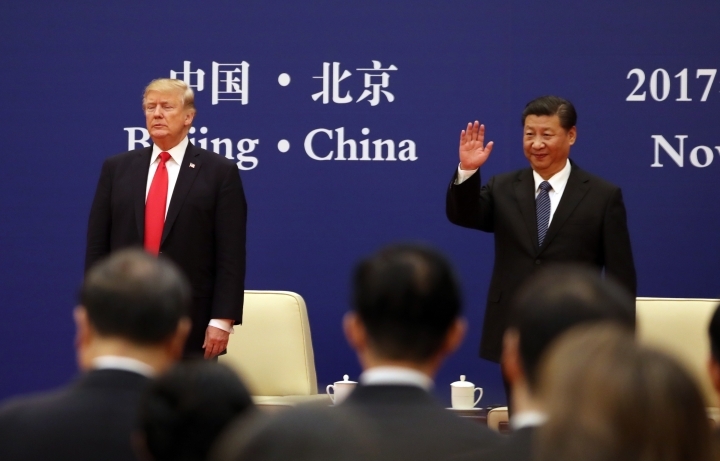 Chinese President Xi Jinping (shee jihn-peeng) has told President Donald Trump that Beijing believes cooperation between the two countries is the "only correct choice" and that relations between the sides have entered a new historic starting point. Xi told Trump at a meeting at the Great Hall of the People Thursday: "We believe that Sino-U.S. relations are a matter of the well-being of the peoples of the two countries as well as the peace, prosperity and stability of the world." Xi said China was committed to working with the U.S. on North Korea, Afghanistan and other issues of international concern. Xi says relations were at a "new historic starting point" and that China is willing to work with the U.S. "with mutual respect, seeking mutual benefits, to focus on cooperation and control our differences." President Donald Trump has received an elaborate welcome on his state visit to China. 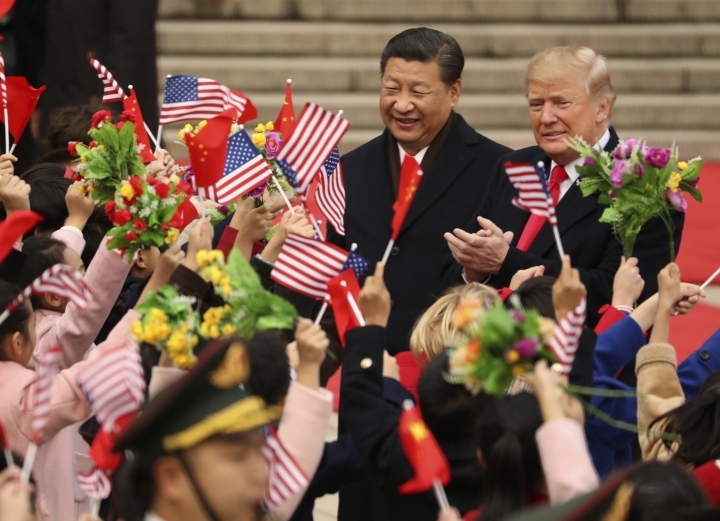 Chinese President Xi Jinping (shee jihn-peeng) treated Trump to a grand display of Chinese hospitality in the plaza outside the Great Hall of the People in Beijing. Children waved U.S. and Chinese flags and jumped wildly. A Chinese honor guard played the national anthems of both countries, and Trump and Xi walked along red carpets to review the troops. At one point, Trump started clapping for the kids. 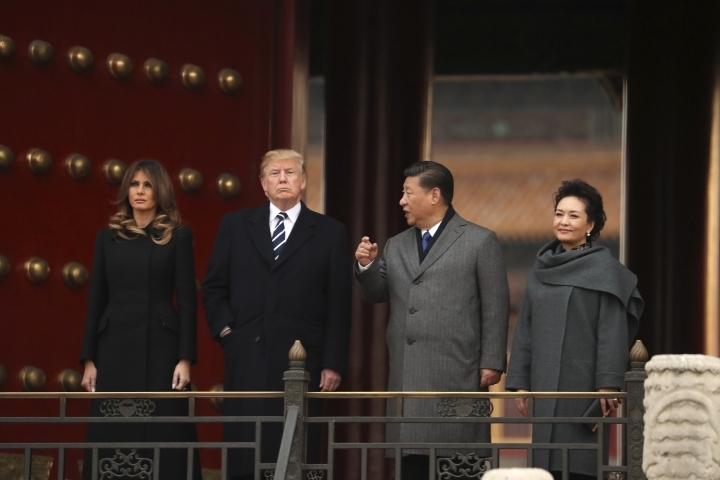 U.S. first lady Melania Trump and Xi's wife, Peng Liyuan (puhng LEE'-yoo-en), also attended the ceremony. The ceremony opens a day of meetings and business events between Trump and Xi that will culminate in a lavish state dinner in Trump's honor. North Korea is responding to President Donald Trump's tough words in Asia by saying the U.S. should oust him from power. State-run media in North Korea is referring to Trump as a "lunatic old man." It says the U.S. should force Trump out "to get rid of the abyss of doom." It says the U.S. should heed its advice "if it does not want a horrible nuclear disaster and tragic doom." Trump is in China, where he is expected to ask President Xi Jinping to do more to pressure North Korea to abandon its nuclear weapons program. Before arriving in China on Wednesday, Trump told the South Korean National Assembly that "all responsible nations must join forces to isolate the brutal regime of North Korea." 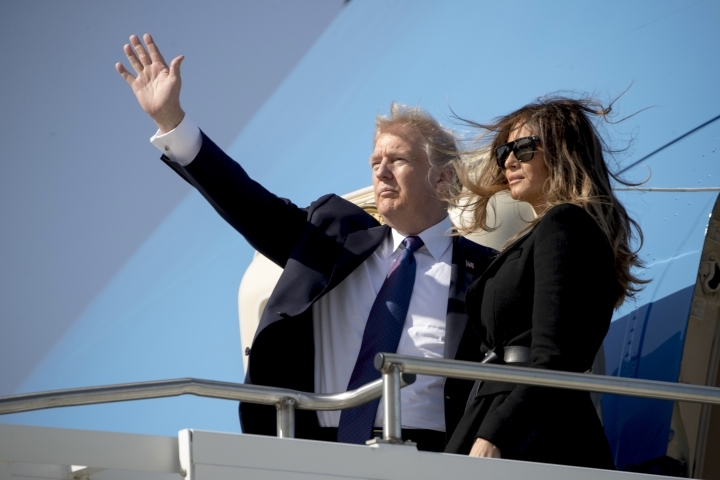 President Donald Trump's visit to China has opened with diplomatic niceties aplenty from Chinese President Xi Jinping (shee jihn-peeng), but thorny issues await the two world leaders behind closed doors. Among them are potential tensions over trade and China's willingness to put the squeeze on North Korea over its nuclear weapons program. Before his arrival, Trump issued a stern message to Beijing, using an address to the National Assembly in South Korea to call on nations to confront the North. White House officials said Trump would make the same pitch to Xi in private when the two sit down together Thursday. China is North Korea's largest trading partner and Trump is expected to demand that the nation curtail its dealings with Pyongyang and expel North Korean workers from its borders. President Donald Trump says his welcome to Beijing was "unforgettable." Trump thanked Chinese President Xi Jinping (shee jihn-peeng) on Twitter on Wednesday. He said: "THANK YOU for an unforgettable afternoon and evening at the Forbidden City in Beijing." Trump added: "We are looking forward to rejoining you tomorrow morning!" Trump is on a two-day visit to China. He hopes to press the rising Asian power on trade and North Korea. 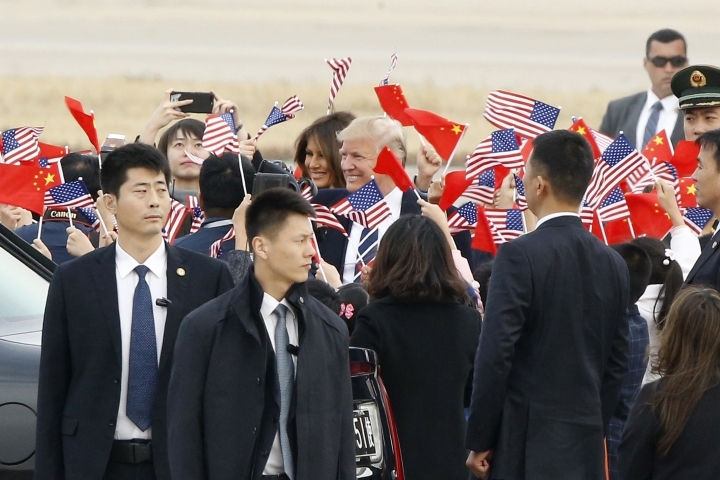 The ceremony accompanying the U.S. president's arrival Wednesday afternoon was elaborate even by China's lavish standards. 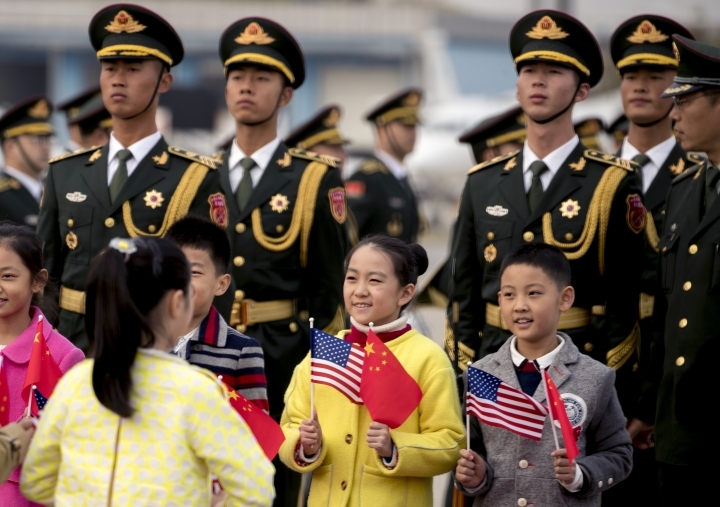 Trump and his wife, Melania, were met by Chinese and American dignitaries, soldiers, a band playing martial music and children waving miniature Chinese and American flags. President Donald Trump's granddaughter Arabella Kushner has once again played a bridging role in U.S.-China diplomacy. 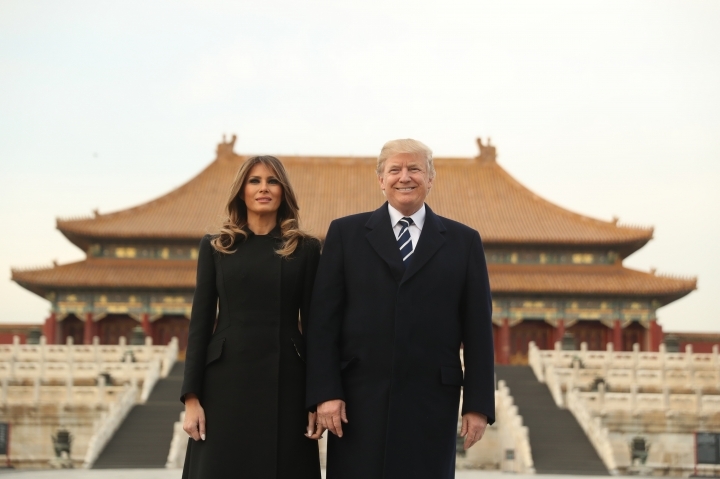 China's official Xinhua News Agency reported that Trump played a video of Arabella reciting ancient Chinese poetry and verses from the Confucian text the "Three Character Classic" to Chinese President Xi Jinping (shee jihn-peeng) after they met at the Forbidden City ancient palace complex in Beijing on Wednesday. 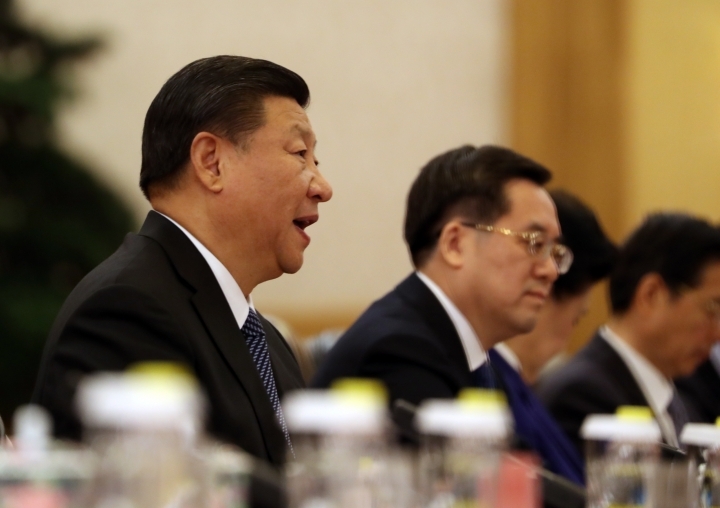 Xi responded that Arabella's Chinese deserved an "A-plus." Earlier this year, a brief video clip of Arabella singing in Chinese circulated to strong approval on the internet in China. The clip posted by Trump's daughter Ivanka showed then 5-year-old Arabella singing best wishes for the holiday while playing with a traditional Chinese puppet. Ivanka Trump and daughter Arabella also made a surprise visit to the Chinese Embassy in Washington in February to participate in Chinese New Year festivities. President Donald Trump says he's having a "great time" in China. Trump commented after he and first lady Melania Trump took in a music-and-dance performance Wednesday in the Forbidden City by young opera students dressed in ornate traditional Chinese costumes. They were joined by their hosts, Chinese President Xi Jinping and his wife, Peng Liyuan (puhng LEE'-yoo-en). U.S. Secretary of State Rex Tillerson and Terry Branstad, the U.S. ambassador to China, are among U.S. officials taking in the performance. The show is part of an elaborate welcome Xi has planned for Trump that will extend into Thursday. After the show, the youngsters shouted "Welcome to China! I love you." China is pulling out all the stops for Donald Trump's airport arrival in Beijing. 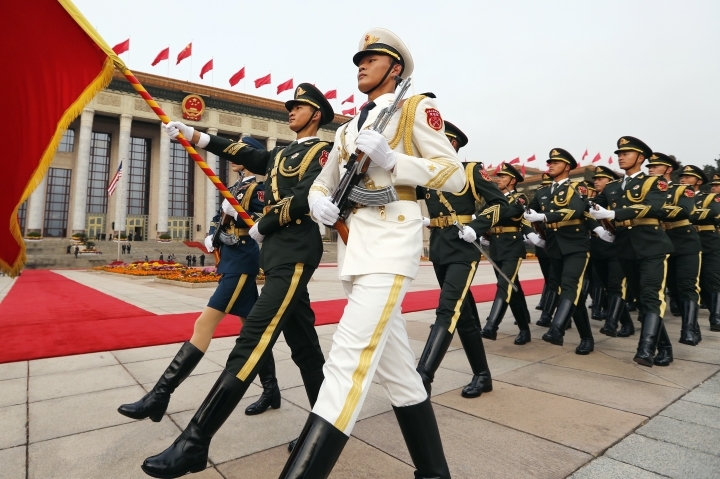 The ceremony accompanying the U.S. president's arrival Wednesday afternoon was elaborate even by China's lavish standards. Trump and his wife, Melania, were met by Chinese and American dignitaries, soldiers, a band playing martial music and children waving miniature Chinese and American flags. 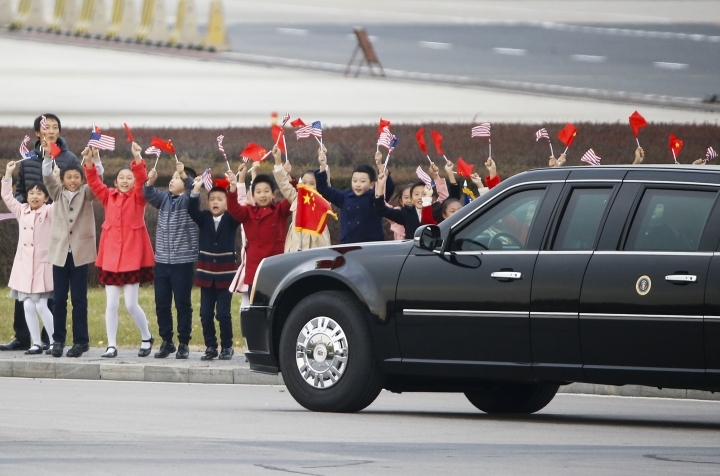 As Trump's motorcade pulled away, the children jumped up and down while they waved and chanted. The U.S. president and first lady appeared pleased, smiling and accepting flower bouquets, with Trump at one point throwing his arms open and appearing to exclaim, "Wow." President Donald Trump is touring the sprawling Forbidden City compound in the heart of Beijing. The 15th century compound was the imperial palace for several dynasties. Access was forbidden to all but the imperial family and those who had business with them. 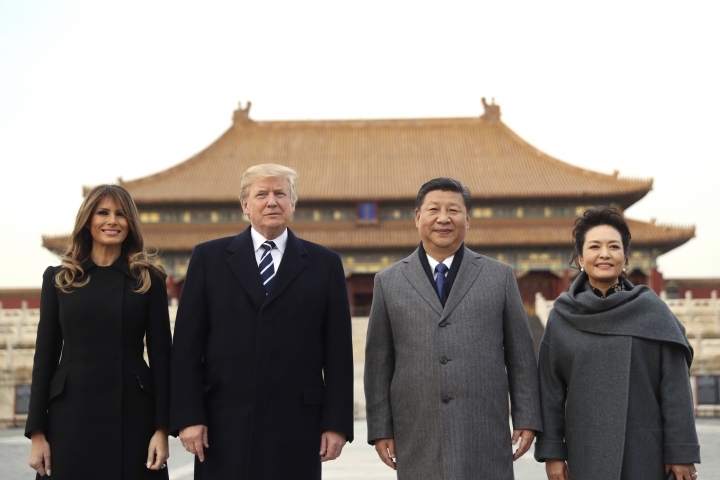 Trump, Chinese President Xi Jinping (shee jihn-peeng) and their wives walked through the Gate of Supreme Harmony and gazed across a sprawling yet deserted courtyard. They all wore overcoats against the chill. After a guide explained the sites, the couples walked down a flight of stairs and into the courtyard. They posed for photos, strolled toward the Palace of Supreme Peace and climbed another long flight of stairs. President Donald Trump will push China on trade and North Korea during a two-day visit in which he will alternately cajole, flatter and scold the rising Asian power. White House aides view Trump's visit to China as the centerpiece of his lengthy tour of the region. Trump is mired in consistently low approval ratings at home and will encounter a newly emboldened Chinese President Xi Jinping (shee jihn-peeng), who recently consolidated power in his country. Before arriving in Beijing, Trump used a speech to South Korea's National Assembly to send China a stern message. He called on China to stop supporting North Korea, China's largest trading partner. Trump said "all responsible nations" must unite to isolate North Korea for its aggressive development of nuclear weapons. Copyright © 2015 - 2019 Entertainment - Malaysian Talks. All Rights Reserved.